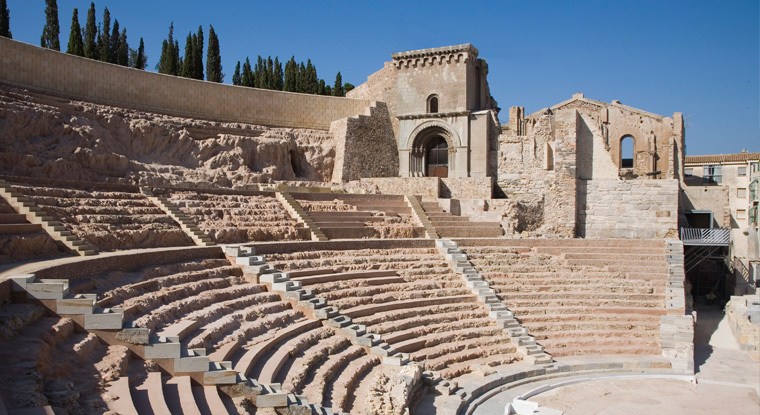 The Roman Theatre of Cartagena has been one of the greatest archaeological discoveries in recent times. Surprisingly, given its size and magnificent architecture, it remained hidden for centuries, as we didn´t know of it until 1988. This is explained because it is situated in an area of the city that has been occupied continuously since the founding of the city to date. The result of this is the superposition of the Old Cathedral on part of the ruins of the theatre, making the architectural set unique and spectacular. Excavation works and research of the site have allowed to know not only the Roman monument, but have made this part of the city a book of history in the hands of archaeologists and historians: become a commercial area in the V century, it became harbor district in Byzantine times and later, in the Islamic period, was reoccupied as urban area and remaining to this day. The architect Rafael Moneo, with a splendid work, has integrated the archaeology and the architecture of the XXIst century. The project includes not only the theatre and the cathedral but also Pascual Riquelme Palace, connecting the archaeological remains through an underground corridor which, through the exhibits found during the excavation, introduces and prepares us for understanding the theatre, converted by the architect in the last exhibition room of the museum. The visit ends with a wander around the corridors and stairways of the cavea, allowing us to enjoy the place as the Romans did in their days. The theatre, built in the 1st century B.C., rose using the slope of the hill of the Conception, located in the inner city, to place part of the stands. With capacity for 7,000 spectators, its construction coincides with a time of renewal and monumentalization of the city. In addition to the leisure function it has a propagandistic function: built during the government of Emperor Augustus and dedicated to his grandchildren, Gaius and Lucius Caesars, it presents them as his natural successors. The decoration, with not only political but also religious content was visible mainly in the most representative areas, the scene and the orchestra, where sculptures, portraits and inscriptions could be observed by all viewers. Currently, more than 2,000 years after its opening and through the efforts of great professionals, the Roman Theatre in Cartagena has regained its splendour and it is, once again, the most visited monument in the region.